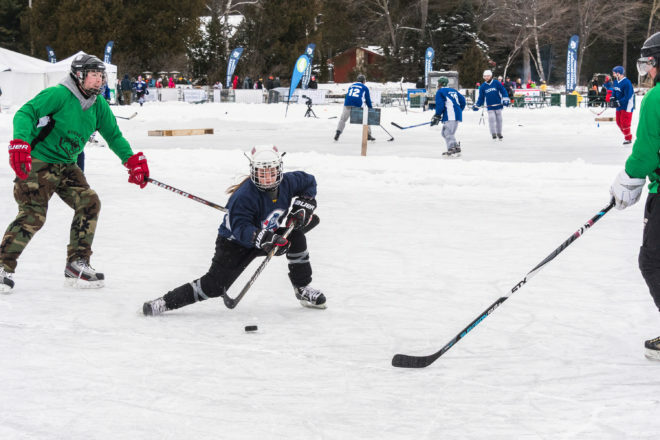 The 2018 Door County Pond Hockey Tournament will bring more than 40 teams to Kangaroo Lake, including teams in two women’s divisions. Photo by Len Villano. Door County doesn’t go to sleep in the winter. Experience another side of Door County at the 4th Door County Pond Hockey Tournament Feb. 10, 2018. Join more than 40 teams in eight divisions competing for the coveted Stanley Thermos, taking hockey back to the pond on Kangaroo Lake in Baileys Harbor to play the game the way they learned it. Registration is now open for new teams. Warm up with a brat and beer by the fire at the lake or in the new spectator warming tent on the ice, or joint us all weekend at Door County Brewing Co.’s new taproom in Baileys Harbor. Register, learn more, and sign up for email updates at doorcountypondhockey.com.